Politician, linguist, collector, soldier and explorer, Sir George Grey is an important figure in New Zealand history. He was the most influential of New Zealand’s governors, serving in the role from1845 -1853 and again in1861 - 1868. Grey started off as an army officer in Ireland before leading an exploring expedition in Western Australia in the late 1830s. His established himself as a very able colonial politician during his governorship of South Australia from 1840-1845. This helped him secure the position of Governor of New Zealand. Between his two terms in New Zealand he was also Governor of the Cape Colony in South Africa from 1854-1861. Three long lost Robert Burns (1759-1796) manuscripts including letters from the well loved Scottish poet and his friends were discovered earlier this year. Chris Rollie, a researcher discovered the manuscripts inside an Extra Illustrated W. Scott Douglas edition of 'The Works of Robert Burns', from 1877-79. This edition belonged to Burns's publisher, William Paterson. One of the discovered letters is from 'Clarinda' the pseudomny for Agnes McLehose. Burns was in love with Agnes and she was the subject of several of his poems including: 'Clarinda (Mistress of My Soul' and 'To Clarinda'. After Burns' death in 1796, Agnes had requested that the intimate letters she had written to Burns be returned to her by Burns' friend and doctor William Maxwell. 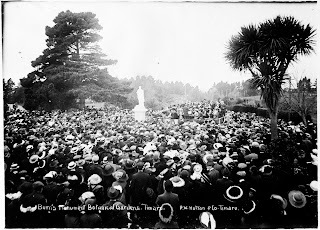 October 2013 is the centenary of the Great Strike, a wave of industrial unrest that affected the whole of New Zealand. The strike - or lockout - began on the Wellington wharves on 22 October 1913. 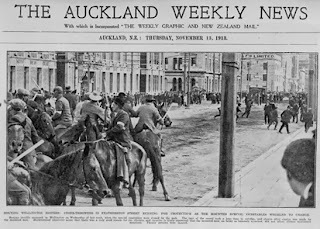 By 28 October the trouble had spread to Auckland. The Reform government under Prime Minister William Ferguson Massey had proposed the use of the military to occupy the wharves, maintain essential services and protect strike-breakers, but ultimately decided to use civilian 'special constables' instead. In the Auckland area, enrolment of special constables began on 29 October. The New Zealand Farmers' Union - concerned with keeping the wharves free and export trade moving - actively sought out volunteers in rural districts. As part of the build up to the First World War centenary commemorations within NZ and around the world, Auckland Libraries, Auckland Council Heritage Unit and Auckland Council Archives have developed an A5 research guide. 'Our boys, our families' outlines the First World War resources available at Auckland Libraries and Auckland Council Archives. This includes: Rolls of Honour, cemetery records, memorials, books and photographs from the Schmidt Collection and supplement to the Auckland Weekly News. 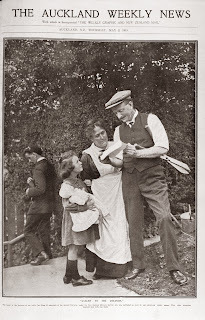 The research guide is intended to assist you with your own research into family members or people who took part in the war. This could be a soldier on the front line, a nurse on a hospital ship or a person on the home front including conscientious objectors. There are a selection of handy research prompts tucked into the back pocket of the guide and a page dedicated to good research practices to help you get started with your research. Unitec students were recently involved in a Landscape Design competition and the winners were announced during the Auckland Heritage Festival 2013 earlier this month. 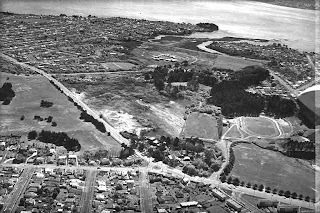 The competition challenged students to come up with a design for Sunderland Avenue, Hobsonville Point, a heritage street which used to be to be part of the Hobsonville Air Force base. A garden designs for the Hobsonville Point Primary School and individual houses on Sunderland Avenue were other categories also included in the competition. The winning designs incorporated an approach towards a 'sustainable coastal community' and 'celebrated the heritage value of the area'. In one part of the printed book collection of Sir George Grey Special Collections there is a section of books grouped by Private Press publisher name. Private Press books can be defined as books printed by hand, in limited editions, with as much emphasis on making an object of beauty as on reproducing a text. Private Press books are excellent sources of inspiration for artists and can be appreciated by anyone who admires carefully crafted things. Examples of books from some of the many Private Press publishers featured in the collection include exquisite first editions from Arts and Crafts era printers the Doves Press and Kelmscott Press, intricate book art from Flying Fish Press and The Whittington Press, and a wide range of lovely books from New Zealand printers like The Holloway Press, Otakou Press, Puriri Press and The Pear Tree Press. Fakaalofa lahi atu. Niue Language Week runs this year from 13 to 19 October. The theme is 'Leveki mo e fakaaoga e Vagahau Niue – Treasure and use the Niue Language'. Did you know that Niueans represent our fourth-largest Pacific group in New Zealand? So it seems highly appropriate to celebrate the Niuean culture and language during this week. The language week has been organised largely by the Vagahau Niue Trust and Matakau Pulefakamotu Niue Okalana, with support from the Ministry of Pacific Island Affairs. Check out the ministry's Facebook page for more information and the programme to find out what is happening near you. 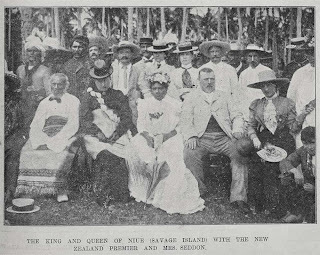 Enjoy the selection of heritage photos below, which are drawn from the heritage collections at Auckland Libraries, to celebrate Niue Language Week. Plaques, benches, statues, arches, stained glass window panes and many other things are commonly used to commemorate events (e.g. coronation of King Edward VIII), celebrate certain days (e.g. Arbour Day) or to remember people who have passed away (e.g. soldiers who fell during a war). Tree planting is another way of marking and creating significance at these occasions and beyond. 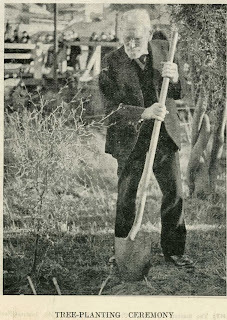 From digging the hole, the planting event itself to the ceremony, these stages can be viewed through the photographs drawn from the heritage collections at Auckland Libraries. The School Journal (known prior to 1949 as the The New Zealand School Journal) has provided New Zealand material for New Zealand’s children since 1907 and is thought to be the longest-running children’s serial publication in the world. It publishes articles, plays, poems and stories - as well as photographs and illustrations. Many New Zealand artists have had their work in The School Journal and the Central Auckland Research Centra is currently displaying journal covers from Colin McCahon, John Drawbridge, Evelyn Clouston, Roger Duvoisin, Michael Cox and Terence Taylor. 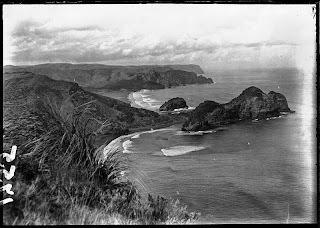 For Māori, Te Henga or Bethells as it is also known, is a very important location. During pre-European times the Waitakeres including Te Henga, was one of the most densely populated areas because food was easy to catch from the sea and grow on the land. The long occupation of this area by the tangata whenua (people of the land), Te Kawerau a Maki can be seen in the large number of archaeological sites scattered along the coast, including 18 pa (fortification sites) and at least 10 kainga (village sites). It is also reflected in the name Te Henga, which means 'the food for a work party'. Meola Creek is called Waititiko by local Maori, meaning 'water of the periwinkles'. It was subsequently named Meola Creek by settler Allan Taylor, possibly after Meola Glacier (or Athasi-Balati Glacier) near where he was born in Seringapatam, India, in 1832. 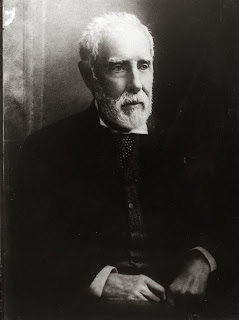 Allan Taylor (1832-1890) arrived in New Zealand aged 16 and soon after began buying land that would become the Alberton estate. In the 1890s he became known as Allan Kerr Taylor. Public baths were constructed in Auckland during the 1880s and this led to a growing interest by adults in swimming. Baths such as Point Erin in Herne Bay, the Tepid Baths in town and Parnell Baths used salt water and this in turn led to sea swimming becoming a popular activity. 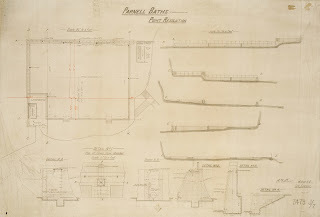 Parnell Baths were Auckland's first salt water baths. Constructed at Judge's Bay in 1914 by the council, the baths have become an iconic and well loved location for swimmers of all ages. At 60m it is the largest salt water pool in New Zealand (although the salt now comes from a bag & not the sea) and tops Newmarket's Olympic pool by 10m. That is a very long length to swim! 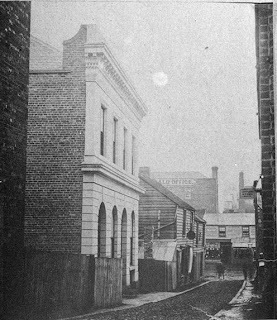 The lane has an interesting history - a fire destroyed much of the area in 1850, and two prominent hotels (still standing today) opened in the decades following - the Queen's Ferry Hotel in the 1860s (pp. 31, 54) and the Occidental Hotel in the 1870s (pp. 31, 53). By the 1890s the lane was overcrowded and getting rather a bad reputation, although there were still professional offices in the street.